"Paul Wilkes's memoir is a love story—and also a story of a struggle with the lover, in his case, God. The son of an immigrant, Wilkes felt that he was called to a priestly vocation, indeed a Trappist vocation. God sent him many signals that this was not his calling. So Paul had to settle for what he thought to be a second-best vocation—a very successful writer. God heaved a sigh of relief. Paul had finally 'got it.' He has written a memoir of the century." "Paul Wilkes is that rarest of people—a deeply spiritual man who is also an absolutely exquisite writer. His absorbing new memoir reveals the wonderful things that can happen when you allow God to lead you along life's often bumpy path—whether or not you know where the journey will lead. This is a beautifully written, frequently haunting, and always fascinating story of seeking and finding, serving and loving, and—ultimately—dying and rising. Highly recommended." "Paul Wilkes's biography takes us through Paul's life, but through the stages of our own lives as well. As a result, at the end of it we can see how we, too, have become more than we ever thought we could be. Wilkes is a great writer–he has a refreshing style, a direct voice, and a stark and unfurbished honesty, even about himself. In Due Season has all the marks of Augustine's Confessions or Merton's Seven Storey Mountain. It gives the rest of us, whatever we've done, wherever we've been, hope. It helps us see the forest of our lives despite the trees. Read this book. It can put the seasons of your own life into better, broader perspective." Paul Wilkes' In Due Season takes the reader on a moving journey through an extraordinary era's thickets of American Catholic life and belief—opening at last into wisdom, affirmation, and hope. Paul Wilkes is an American writer, speaker, and filmmaker who is best known for his focus on religion, especially Roman Catholicism and its monastic tradition. Wilkes has written for the New Yorker, New York Times Magazine, and Atlantic Monthly. His book, In Mysterious Ways: The Death and Life of a Parish Priest, won a Christopher Award. In addition to Merton, his PBS documentary, Paul was host and writer of the acclaimed television series Six American Families, which won a duPont-Columbia award for documentary excellence. 3. High School: The Man in the Ten-Way Suit. 4. Coming Home, Leaving Home. 5. College: Red Arrow Park. 7. One Hot Day . . . and Night. 9. The Big Time, More or Less. 18. The Scent of a Woman. 19. On the Playing Fields of the Hamptons. 20. The Perfect Girl for You. 24. A Place to Park. 27. A Monk, at Last. 31. Return to St. Peter's. 32. A Light in the Window. "Paul Wilkes has written the first 21st-century Christian classic. His In Due Season: A Catholic Life will rank alongside, not run second to, Thomas Merton's The Seven Storey Mountain. It is its companion volume. ? The bridge between ideals that Wilkes builds with this book carries the American Catholic story from the ghetto, through war, through Vatican II, through the hedonistic 1970s, through a changing church, through the ravages of affluence and easy money, to the questioning of today. ? In Due Season ranks alongside Merton's best because Wilkes absorbed Merton, then moved forward with him, and ultimately beyond him." --National Catholic Reporter, reviewed by Arthur Jones, published March 6, 2009. 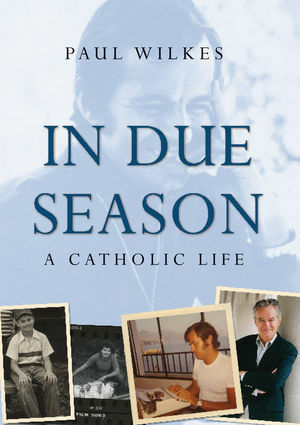 "Paul Wilkes has written an honest and revealing memoir in which nothing is held back....In Due Season excels on many levels. Wilkes is a felicitous writer who can be read for the simple pleasure of connecting with a prose artist."